It's not supposed to be easy, winning a bid to the Olympic Games in any discipline, but that makes it more satisfying for the winners, if heartbreaking for the losers. So it was in Sunday's climax of the U.S. Olympic and Paralympic Team Trials â€“ Sailing on the West Coast. (Deltaville, Va.)- Fishing Bay Yacht Club will hold its 68th annual One-Design Regatta Saturday and Sunday, August 11-12, 2007. Some readers have written me recently asking questions about how the rules cover some situations that crop up frequently at marks. Answering them gives me the opportunity to stress some of the important ideas that you should keep in mind as you approach a mark. Cruising the Mediterranean is an experience of delight and frustration. Being first in and tied off then watching the rest of the fleet arrive is perhaps one of the world's greatest spectator sports. The following tales are real, though to some, they might smack of nationalistic stereotyping and a vivid imagination. It may be only a coincident that these nationalistic traits seem to consistently repeat themselves. These are just stories of multi-national cruisers arriving to "Med tie" to the same rock wall on a small Greek island village. North's 3DL technology may lead the grand prix market, but other sailmakers have worked hard to developed their own laminate-sail technology. An in-depth look at the state of the art of sailmaking. If you had to take a guess at which one-design keelboat class you'll find at all nine of Sailing World's Sperry Top-Sider NOOD Regatta stops, it shouldn't take you long. 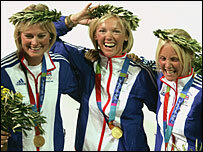 Remember the "three blondes in a boat" from the Athens Olympics? Three years ago the glamorous trio were on top of the world. But now, Britain's Yngling gold medallists face a tense shootout among themselves. The Vang: How Much is too Much? As summer jobs go, 15-year-old Brian Guilbert's is a cool breeze. His place of employment is underneath the clouds and on top of an inland sea. There are no supervisors hovering around to tell him what to do - except for maybe the waves and the wind. Fog mixed with rain dampened the air but not the racing atmosphere at the Storm Trysail Club's Block Island Race Week XXII presented by Rolex. After yesterday's around-the-island race, the event's 2000 sailors competing on 183 boats were anxious to get back to buoy racing to add bulk to their score lines. Though the southwest winds generally blew lightly, the race committee managed two races for 17 of 18 classes on three courses: White (One-Design), Red (IRC) and Blue (PHRF). The Great Lakes Singlehanded Society will be sanctioning the simultaneous running of the 29th Port Huron to Mackinac and the 11th Chicago to Mackinac Solo Challenges on June 23, 2007. These two events represent one-half of the membership granting challenges of the GLSS â€“ any first-time finisher of the event earns a lifetime membership in the Society. The Solo Challenges bring out the ultimate in both boat and skipper â€“ they require a skipper who must manage not only the racecourse, but also the sometimes demanding weather conditions, vessel upkeep, and last but certainly not least, the skipper himself. This week Etchells sailors from Italy, Australia, Sweden, Ireland, Hong Kong, New Zealand, Bermuda, the USA and Britain are congregating at the Royal Corinthian Yacht Club, Cowes in preparation for the 2007 Etchells World Championship. Forty-six of the world's top sailors, who have all been required to qualify to represent their countries, will be battling it out in the central Solent for the right to claim the Etchells World title - one of the most prestigious in international sailing.